Here’s a familiar conversation: A client (or prospective client) tells me they want more followers for their Twitter (or Facebook) account. I respond by asking why they want more followers, and whether or not it will help them achieve their goals. And most clients, after a bit of discussion, do grasp the now widely-understood idea: good use of Twitter is not all about striving for follower numbers. But how about Twitter’s ‘other’ number? There’s another figure shown on everybody’s Twitter profile that’s equally open to misunderstanding – potentially even more so. It’s the ‘following’ number – the total number of people being followed by a user. Each user has complete control over this number, as it’s often considered the primary way for most people to manage what they see when they view Twitter. While we’ve accepted that follower numbers are to be taken with a pinch of salt, there appear to be some misapprehensions about its lesser-quoted companion, the ‘following’ number. It has become a kind of shorthand for deciding how engaged a person or brand is with other Twitter users. An account seen to be following many others is assumed to be sociable and engaging, while one following just a few people is often regarded as aloof or non-conversational. I want to challenge this assumption. Two things got me thinking about this – firstly a good debate I had via Twitter with Brighton/Vancouver-based travel writer Nikki Bayley, unimpressed with Twitter’s suggestion she follow a high-profile journalist with precisely no followers. Secondly, Mashable published an op-ed piece by Ted Rubin that warns of the dangers of unfollowing one’s followers – a post I feel really misunderstands and oversimplifies the mechanisms of Twitter. So what’s my problem with checking out an account’s ‘following’ number as a gauge of interaction? I believe it’s misleading to use ‘following’ numbers as a shorthand measurement for a brand’s level of listening. In fact, it is no such thing. Patting oneself on the back for having a good ‘following’ number is almost as misguided as hankering after an ever-higher number of followers. Repeatedly clicking ‘follow’ may offer us the feeling of listening, with just a single click. But is this an illusion? Twitter gives us many ways to find relevant conversations. There are a range of searches, lists, groups, hashtags and apps to help us navigate to the people and the comments that need our attention. For most brands, the simple ‘following’ mechanism (great for personal users) is just too clumsy a tool to have much meaning or utility in itself, so more nuanced forms of listening have to take place. To judge an account by a ‘following’ number is to draw conclusions about the ways a person or brand uses Twitter to listen. There are several brands who follow low numbers of people but who conduct their listening very well. Look at international rail operator @Eurostar‘s customer care account. They follow just 153 people (though they are followed by over 5,000) but they appear engaged in some real attentive listening, responding to grievances and resolving issues for many people. A glance at their measly ‘following’ number tells us nothing of this. 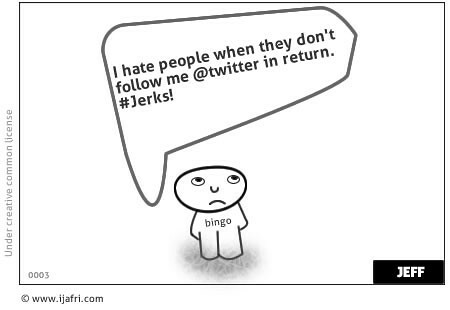 Correspondingly, find a corporate Twitter account with an evident ‘we-follow-everyone-back!’ policy. Do they listen, engage and respond? Maybe they do, maybe they don’t. Their following score makes no difference to this. There are various brands (and people) who I know don’t follow me on Twitter, despite the fact that I follow them. Do I mind? No. Why should I? If I know that they’ll listen to me and they’ll get back to me when I need them to, then we have a worthwhile relationship on Twitter. A ‘following’ number is NOT an indication of effective listening. It’s just a number. It’s an externally visible clue regarding just one of many tools an account might use to find relevant conversation. But it tells you very little about the way someone really listens. Am I suggesting you unfollow everyone in a huge Twitter-cull? No I’m not. I think that would be a waste of a valuable tool and might give an unfortunate impression. But don’t get hung up on that ‘following’ number – your own or other people’s. Don’t judge a person or a brand by the number they follow – look instead at what they’re saying and how they’re saying it. The act of following in itself is meaningless unless we expect major brands to manually sift through millions of tweets from thousands of people, searching for relevant conversation. I’d rather companies spend their time and money listening and responding more selectively and intelligently. That’s what really counts – not just a number. While the follow button is no substitute for listening, it does open up another channel for communication. Twitter’s direct message functionality is dependent on following. Clients of ours in industries such as transport use DMs as a way to take a Twitter conversation ‘offline’, especially when sensitive personal information is being exchanged. Get rid of your ‘All friends’ or ‘Home feed’ column – the one that shows you the feed of tweets from people you follow. Don’t worry – you can put it back later. Now look at your other columns. By default you’ll probably have a column of direct messages and an @ mentions column – arguably the most important view of Twitter for any brand who claims to be listening. Now add some more. Add columns that search for your company name and the names of your key products. Use AND, OR and “double quotes” to help gather together various terms in one column and take into account abbreviations or common misspellings. Experiment. Now how about your competitors and partners? Add a column or two to take into account what’s being said about other people in your industry. Journalists and industry pundits? Use Twitter’s list function to place your favourite 20 pundits in one place where they can be browsed, retweeted and engaged in conversation. Add a couple more columns for issues, events, hashtags and topics relevant to your work. Now sit back and look at the way the information flows onto your screen. Use this set-up for a few hours, or even days. With a bit of experimentation, you can build yourself a useful dashboard. What do you notice? It’s very likely that many of the words you’re looking at have been written by people you’re not following. It’s really not important. So follow people all you like. That’s fine. But don’t judge a brand or person by the size of their ‘following’ number. And never ever kid yourself you’re listening – really listening – because you’ve followed all your followers back. Real listening takes more than that. Cartoon by Sifarat used under Creative Commons licence. 1 Response to Letting go of Twitter’s other big number. And learning to listen.